Sean Rafferty presents music and guests, including jazz pianist Jools Holland talking about his new record and performing live. Plus violinist Jennifer Pike, also playing live. 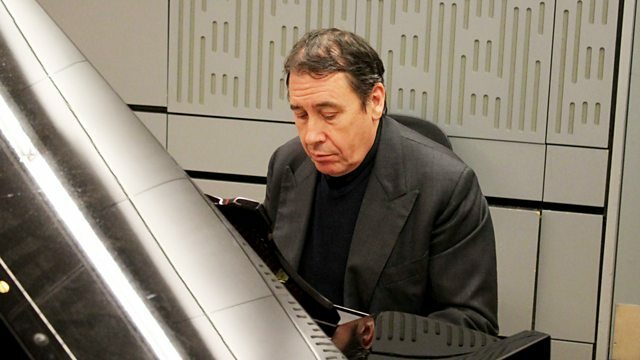 Sean Rafferty's guests include jazz supremo Jools Holland who is in to talk about his new record and will perform live in the studio, and choreographer Michael Keegan-Dolan talks Swan Lake at Sadler's Wells. Plus violinist Jennifer Pike pops in to perform live ahead of her concert at Cadogan Hall. Britten: Young person's guide to the orchestra etc: LSO/ECO/Britten. Performer: Stephen Hough. Orchestra: Berlin Philharmonic Wind Quintet. Mozart: Quintets: Berlin Philharmonic Wind Quintet/ Hough. Orchestra: RTÉ National Symphony Orchestra. Conductor: Jean-Luc Tingaud. Bizet; Roma / Marche Funebre / Patrie Overture / Petite Suite. Singer: Sonya Yoncheva. Singer: Karine Deshayes. Ensemble: Amarillis. Director: Héloïse Gaillard. Singer: Lucy Crowe. Choir: Choeur and Musiciens du Louvre. Conductor: Marc Minkowski. Purcell; Handel; Haydn - To Saint Cecilia. Performer: Crispian Steele‐Perkins. Singer: Elin Manahan Thomas. Director: Christopher Monks. Orchestra: Armonico Consort. Let The Bright Seraphim Works by J.S. Bach, Telemann, A.Scarlatti and Handel.